Having just returned from iNACOL’s Blended and Online Learning Symposium, I am confused by the term “Blended Learning.” Not confused in my understanding, but I am confused how to explain this concept to executive administrators and boards of education. The current definition as illustrated above is too confusing and not specific enough. Right now the definition works for those studying the field, but it is too fuzzy to explain to executives and boards, whose heads are already spinning from the acronyms of state and local budgets, special education, and other reform movements. Who is your audience and what are their needs? What do you want them to learn? How will you know when they learned it? What learning strategies can be used to help the target audience learn? What technologies can be used to support the learning? Taxonomy is a challenging endeavor. Michael Horn and his associates have an incredible body of work studying the effects of computer aided instruction and its impact on school settings. While at the conference, presentations and conversations were about “blended programs;” the explainers described their setting with multiple sentences. When we have to explain too much to executive administration and boards that’s a problem. We should be able to explain our settings in 50 words or less. Define the online learning component with sharper terms. Because the field is pushing competency (mastery) education, this definition should distinguish this as data-rich. Students, teachers, and parents will have data to show progress. My graduate program has data, but not at the level possible with “big data” from emerging systems. Stop changing the terms. The term “Self-blend ” became “a la carte” earlier this year. I will continue to call this model “supplemental” as it is descriptive and tells me that this supplements a traditional catalog of subjects and courses. The “enriched virtual model” is a hybrid model, mixing traditional settings with digital learning outside school. Most administrators have witnessed or taught in rotation models. A traditional elementary classroom employs the rotation model daily without the computerized instruction. The association is easy. Make connections to traditional programs whenever possible. It helps the understanding of risk-averse leaders. Further decide whether we are using instructional models or learning models. There is a difference. Instructional models focus in what teachers do. Learning models focus on what students do. Notice the instructional design notes above. For me it’s about learning not teaching. The researchers will continue to refine the terminology and sharpen the descriptions. Thanks to Michael Horn, Heather Staker and associates for their continued efforts to refine their descriptions. Yet for me, the terminology is not ready for prime time. Bush, J. & Wise, B. (2010). Digital learning now. Tallahassee, FL: Foundation for Excellence in Education. Cavanaugh, C. (2009). Getting students more learning time online: Distance education in support of expanded learning time in K-12 schools. Washington, DC: Center for American Progress. Creative Commons (n.d.). Creative Commons. Mountainview: CA: author. Retrieved from http://www.creativecommons.org. Dawley, L., Rice, K. & Hinck, G. (2010). Going virtual! 2010: The status of professional development and unique need of K-12 online teachers. Boise, Idaho: Boise State University. Gabriel, T. (2011). “More pupils are learning online, fueling debate on quality. New York Times. Retrieved http://www.nytimes.com/2011/04/06/education/06online.html?_r=3&hp=&adxnnlx=1302087708-EMsB5jdWPK44Az0g%20r/0Cw&pagewanted=all&amp;. International Association for K12 Online Learning. (2011). National standards for quality online learning, version 2. Vienna, VA: Author. Illinois General Assembly. Remote educational programs. Public Act 097-0339, 2011. Flora, J. (2011). Digital curriculum: Instructional and Administrative Strategies. Seattle, WA: Apex Learning. Maryland Online. (2010). The grades 6-12 edition of the Quality Matters rubric. Annapolis, MD: Author. Patrick, S., Edwards, D. Wicks, M. & Watson, J. (2012). Measuring quality from inputs to outcome: Creating student learning performance metrics and quality assurance for online schools. Vienna, VA: International Association for K12 Online Learning. Rice, K., Dawley, L., Gasell, C. & Florez, C. (2008). Going virtual! : Unique needs and challenges of K12 online teachers. Boise, Idaho: Boise State University. Staker, H. & Horn, M. (2012). Classifying K-12 blended learning. Mountainview, CA: Innosight Institute. Wagner, J. (2012). Pennsylania Cyber Charter School: Performance audit report. Pennsylvania Auditor General. Watson, J., Murin, A., Vashaw, L., Gemin, B, & Rapp, C. (2012). Keeping pace with K12 online & Blended Learning: An annual review of policy and practice. Durango, CO: Evergreen Education Group. Watson, J., Gemin, B. & Coffey, M. (2010). Promising practices in online learning: A parents guide to choosing the right online program. Vienna, VA: International Association for K12 Online Learning. Wise, B. (2010). The online learning imperative: A solution to three looming crises in education. Washington, DC: Alliance for Excellent Education. In digital settings, students need to hear from their instructors. Learning in a digital setting is not learning alone. It’s not learning from a computer. The teacher is essential to the instruction and the learning. However, students need to hear from a variety of voices. The instructor is one of them. The others are experts in the field, who can communicate with students. The “not invented here” attitude is arrogant and a major error waiting to occur. I’ve developed content. Developing quality content takes a long time; it’s a difficult task. From a design point of view, it’s better to borrow it, such as that from OER or what’s available from other resources. I’d prefer to borrow quality content that meets my students’ goals rather than to reinvent it because somebody else made it. From that design view, making your own content is the least desirable after borrowing it or buying it. Find and use quality content whenever possible before constructing it yourself. 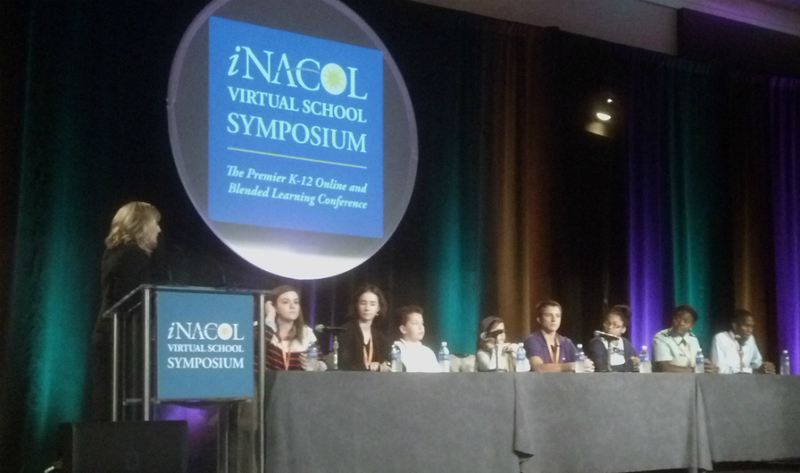 Over 2,000 conferees assembled in New Orleans, Louisiana for iNACOL’s edition of its Virtual Schools Symposium held October 21-24, 2012. Across the program, presentations looked at research in the field, instructional models, administrative successes, and policy proposals. This year’s conference focused on the trends in the field that includes blended (hybrid) learning. In their session iNACOL’s Rob Darrow and Innosight Institute’s Michael Horn clarified that in blended learning models, teachers have the ability to look at student achievement data daily, a feature not available in traditional classrooms. Blended learning is a mix between traditional instruction and student control and self-pacing. Student-centered personalized learning. In this view, students have the ability to learn at their own rates and choose their own learning paths. Students will receive credit when they learn a major concept, not at the end of the course or semester. Smart learning systems will be developed that learn as students use them. During his presentation, John White (twitter: @Louisianasupe), Louisiana Superintendent of Education described the tension between traditionalists and reformers. He asked that both sides come togther and develop a system that meets today’s needs. The workplace and the family have changed so schools should follow. He cautioned technologists that schools are not ready to implement technology. Infrastructure is not ready in many parts of his state and across the country. White thinks that control needs to be local, that other forms of schools can be successful (vouchers and charters), and certification stops innovation. In research provided by the Marzano Research Laboratory and Plato Learning students in online courses have greater success the more time that teachers are in the courses interacting with students and their work. For teachers who are logged in for over 530 hours, students’ end of semester score averaged 81% compared to 62% for teachers who logged in less than 39 hours. In a session about quality, Susan Patrick and Evergreen Education Group’s John Watson outlined the issues. Quality has been defined as course inputs; that is, quality courses have certain features. Patrick and Watson described the move to performance metrics, such as portfolios, individual growth, college readiness, career readiness, and others. They called for pilot programs to test these ideas, and to influence policy and legislation. In another general session, Karen Cator of the U.S. Department of Education described the need for high end assessments, multiple measures for success, and multiple proof points specifically calling for policy makers to focus on educational issues that is about individual student learning. The student panel always highlights valuable statements from students about how they are learning in online and blended models. In these settings, it appears that nobody speaks for them. The discussions are usually around adult perceptions and views. In my all-day preconference session, Judy Bauernschmidt (Colorado Department of Education), John Canuel (Blackboard), Holly Bryzcki (CAIU), and Phil Lacey joined me in taking participants through the process of starting an online program. Our slides follow. The field is beginning to mature in its thinking. Policies, practices, and results will determine the success of this innovative movement. Next year’s VSS is in Orlando, Florida. The SLATE Conference is October 11-12, 2012 at the Northern Illinois University campus in Naperville, Illinois. The conference brings together conferees who are interested in non-traditional forms of learning, especially in electronically supplementing traditional courses or implementing online courses. The slide deck is below. In the rush to digital learning, school districts may be willing to grasp at any branch of the digital tree that they hear about from peer districts or at the latest conference. It is essential to match the type of learning (blended, online) with target student group. Academic Achievement — Good students are good students regardless of the learning environment. Online learning does not suddenly make a poor student a high achiever. Organization — Students learning online must be organized. Technology — Technology must be present where they are learning. Self-regulation — Students must be able to put themselves at the place they want to learn and to drop all distractions. 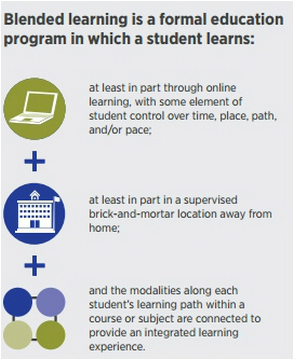 The Innosight Institute published a classification of blended learning programs. The study largely outline the blended practices in traditional brick and mortar institutions. The models include direct instruction from teachers, group projects, and computer mediated instruction. In some cases, students rotate between stations or there is a flexible schedule to pull out students who need extra help or for group activities within the brick and mortar context and traditional school day. Check the referenced research above for specific details. Beyond the opportunities outlined by Innosight, schools can consider blending classes rather than constructing new schools. Students could be scheduled to be in physical attendance only half the time. A senior year experience could provide a blended environment to prepare students for their next steps in education, the job market, or the military. It must be noted that districts and states need various policies and enabling legislation to allow students to gain credit for students in partial attendance. In Illinois, we have legislation that allows students to participate in non-traditional programs and the school district can receive state funding for those students. Whether to blend or to engage students fully online can be determined by the characteristics of the students. Roblyer’s research provides insight on how to develop various programs, depending on the characteristics of the students. High achieving students should be put into online courses. They can work at their own rates to be somewhat self-sufficient. Average students can be successful in hybrid (blended) learning environments, where they get the direct instruction they need, yet they can work on their own when possible. Low achievers need focused help from teachers in small groups. Before jumping on the digital bandwagon, schools should step back to look at the target student population and consider the modes of learning where that group can be successful. Is innovation a democratic process? In Disrupting Class, author Clayton Christen informs school boards that introducing digital learning into schools may be hampered by purposeful democratic processes that are part of schools’ cultures. Cooperative tools like “financial incentives, negotiations, vision statements, training, performance metrics, and even litigation . . . don’t work most of the time. . . . [L]eaders often waste their credibility, energy, and resources when implementing change. The efficacy of any tools in eliciting the cooperation needed to march in a new direction depends in two variables: the extent to which the concerned parties agree on what they want, and the extent of their agreement on how to get it. We have concluded from examining school through this lens that democracy itself — as practiced in most school boards — is a fundamental barrier that will block implementation of many of the changes [needed for successful digital learning] unless leaders deal with it correctly (p. 227). Reflect on this question: When was the last time innovative emerged from a school committee? I am referencing issues that really improved (changed) learning for kids? Never seen it happen in a curriculum committee and certainly never in a “technology committee.” Legislative mandates force certain changes upon schools. Innovation in schools does not happen from within the established system. Real innovation occurs with through a visionary leader who gathers like minded supporters that are committed to helping the vision become reality. Look at the picture at the top of this posting. Was the light bulb developed by a committee? As schools consider new ways to bring digital learning opportunities to their students, they need strong leadership and perhaps undemocratic methods to make this a reality. Otherwise are kids will remain early 20th Century learners.